Home→The Inspired Mic Spotlight→Aynne McAvoy – The Inspired Mic July 20th! ← The Inspired Mic in June! Just Who Are THEY Anyway? 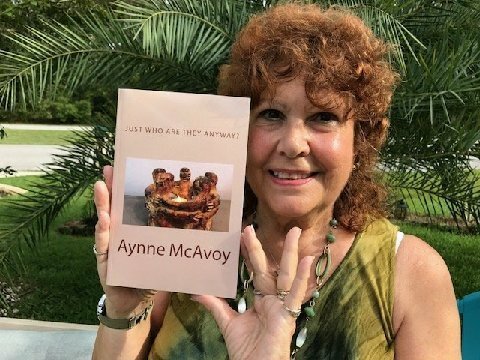 is an account by Aynne McAvoy, psychic and owner of Golden Trines metaphysical of her life long experiences with the angels. She brings us through the years from 1952 to 2017 with some of her interactions with them. The second half of the book introduces you to these lovely light filled beings, who call themselves simply THEY. These beings give us all a simple spiritual GPS to navigate through our daily issues, both big and small. THEY have a fantastic sense of humor as THEY lovingly guide us with these messages. The first of what will be a three book series. Brand new, just released! Available on Amazon.com in paperback, Kindle and FREE on Kindle Unlimited! Aynne is a transplant from Syracuse NY in 2009, when she moved to Palm Coast, Fl with hubby and her two cats. She has been a very busy little metaphysical bee since alighting here in our city!